One Stop is a well known local Mexican food restaurant owned and operated by gringos for over 25 years. This place was once know as the One Stop Taco Shop, and had a building on Highway 69 on the north side of Indianola. 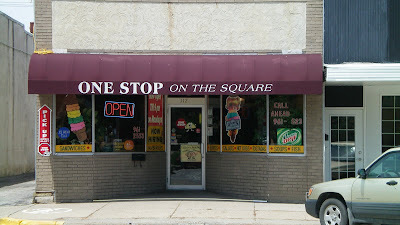 Eight years ago It relocated to the north side of the town square, and changed to the One Stop Sandwich Shop. Menu claims local newspaper poll awarded this restaurant the "best tacos and onion rings in Warren County". 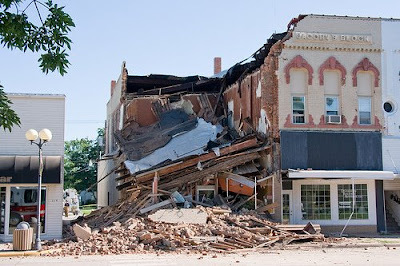 Sadly, the building collapsed on Sunday morning. Location: 112 W. Ashland in Indianola. About ten miles south of Des Moines. Directions: Its in the middle of the block on the north side of the square. The square is a few blocks west of the highway that runs through town. 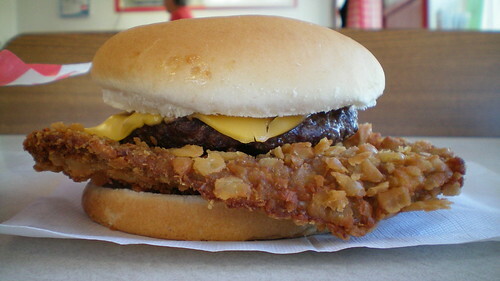 Price: $4.69 for jumbo size, also available in regular size for $3.49. Also on the menu: Fresh made flour tacos are the house specialty. A huge menu of Mexican dishes, burgers, fried chicken and appetizers are also available. Ice cream is also served. Service: Order at a counter, after looking at large menu on the wall. Wait for your number to be called, and pick up food from kitchen window. Ambiance: Nice natural light from large front windows in a high-ceiling dining room with booths and tables..
For Emergency Tenderloin Cravings: go south to the Crouse Cafe for one of the best in the state. Signatures Grill serves an okay homemade tenderloin as well. 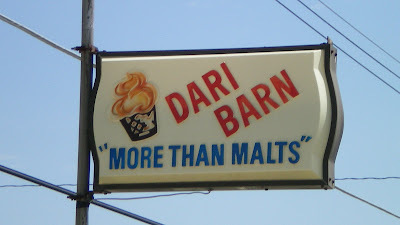 Just down the road from the liberal arts college is the Dari Barn. 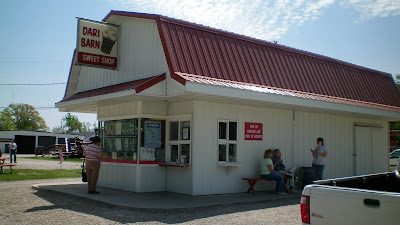 This ice cream stand carries on the great tradition of barn-shaped dessert stands that have lines stretching in front during the summer months. Location: 1810 6th Ave in Grinnell, Iowa. Directions: Drive east on Highway 6 from downtown Grinnell, look for barn-shaped building. 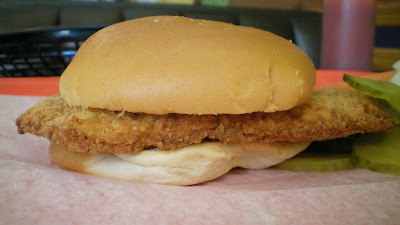 The Tenderloin: After ordering, I was asked If I wanted "everything" on the sandwich. What I got was a whole garden of veggies between a large bun. 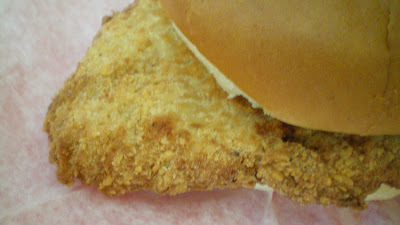 The pork loin is cut fresh, and was nice warm and crispy, but way too small. The bun was not toasted. This is a thin cut of pork loin dwarfed by the fixings and bun. 5/10. Also on the menu: a large selection of ice-cream favorites, soft-serve, frozen yogurt, fried stuff, baked potatoes, hot dogs, and sandwiches. "More than malts" indeed. Service: You order from a small window and talk to a teenage kid, who gives you a number to wait for. Ambiance: Classic small-town ice-cream stand. Picnic tables for sunny days, and a gravel parking lot. 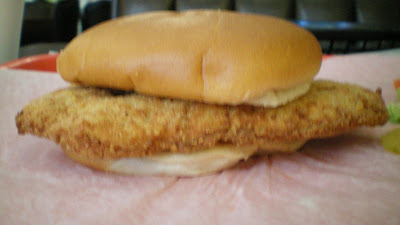 Final Thoughts: I think the reputation of this sandwich preceded my trip and led to disappointment. 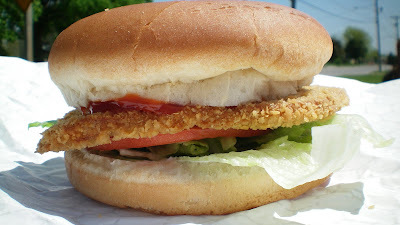 The thin cut of pork loin is the most boring form of tenderloin sandwich. This is a nice place for dessert, but skip the tenderloin.